Andrew Marion (Andy) Eubanks was born on September 21, 1935, in Gonzales, Texas to Sam Houston Eubanks and Fannie (nee Kerby) Eubanks. He passed away on Tuesday, April 3, 2018 in Bryan, Texas. A celebration of life will be held at Hillcrest Baptist Church on Boonville Road in Bryan, on April 9. Visitation at 10a.m. will be followed by the service at 11a.m. Andy grew up in San Antonio and met the love of his life, Geneva Schueneman in 1953; they married in San Antonio in October 1954. At the age of 21, he qualified to apply for a job as a Trooper Recruit with the Texas Department of Public Safety. 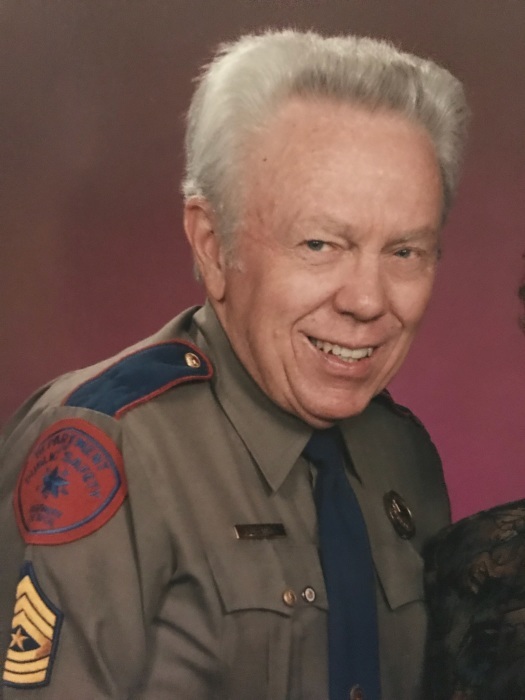 He graduated in 1957 as a Patrol Officer assigned to work the Gulf Freeway near Galveston as a motorcycle officer. He applied for a transfer in early 1962, and was subsequently stationed in Johnson City for 15 years. During that time, LBJ became President of the United States, and Andy worked security at the Texas White House alongside the Secret Service when the President was in town. Andy loved his job and all the people in Blanco County with whom he worked, and whom he worked for. In 1977, Andy attained the rank of Sergeant and moved to Midland, where he stayed for 15 years until retiring in 1992, having worked for the DPS for 35 years. Andy was a natural raconteur, who could tell of his life and trooper experiences in a colorful and humorous fashion. He kept all who were listening spellbound. Andy was a man of great humor and judgment who was able to make lifelong friends throughout the state. He loved sharing time with his extended family, solving crossword puzzles, and was an avid reader. He was an Astros fan since their inception, enjoyed Blue Bell ice cream, pecan pie, and was a past Board member of the Johnson City Library, and the Blanco County Grand Jury. He and Geneva enjoyed van and trailer camping for over 25 years. The troopers and staff that worked with and for him would tell you that he always had their backs and that he enjoyed the road more than sitting behind a desk. Andy was the youngest of 5 children. He was preceded in death by his parents, and his older brothers Claude and Melvin Eubanks. He is survived by two siblings, Huard Houston Eubanks, and Dolly Eubanks Bingham. He is survived by his wife of 63 and 1/2 years, Geneva Schueneman Eubanks, his son Sam Eubanks and wife Mary Evelyn of Dallas, daughter Brenda Eubanks Chambers and husband Scott of Sugar Land, and son Russell Eubanks and wife Tamara of Johnson City. He had eight grandchildren, seven great-grandchildren, and numerous cousins, nephews, and nieces. Andy will be lovingly remembered and sorely missed. A gathering will be held on April 28 in Johnson City to celebrate Andrew’s life. The Eubanks family would like to thank the DPS and everyone for their outpouring of prayers, sympathy, and support.